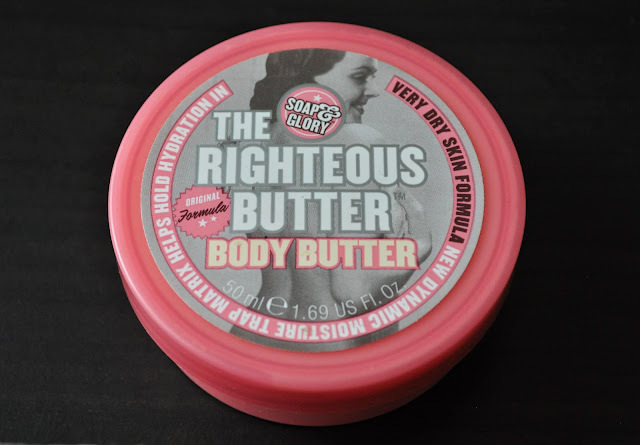 This past Sunday, while tidying up my apartment, I found Soap & Glory's The Righteous Butter Body Butter (can they add any more butter to the name?!) in a box. I'm almost certain I got rid of this body butter, but there it was...staring back...mocking me, just like the cat from "The Cat Came Back" song. This 50 ml/1.69 us fl.oz size was a Sephora Beauty Insider Punishment...excuse me, I meant reward. The Righteous Butter Body Butter claims to have a new dynamic moisture trap matrix that helps prolong, and lock in moisture, and soften the skin. Promising claims, and possibly true, but I couldn't get past the revolting smell. Oh my goodness! I think patchouli smells better than this body butter...and that's saying a lot because I loath patchouli! The first time (and only time) I used this moisturizer, I put it on my arms and legs. Immediately, I was overwhelmed by the vile scent of a floral perfume gone bad (rotted), mixed with laundry detergent, and crushed up vitamin pill supplements. I started to get a headache and feel sick from this product, quickly taking a shower, and ridding myself of this horrid fragrance. For those of you who like this product, this post is not meant to offend or insult. But Soap & Glory and I we not meant to be. And as a the late, great Gen. George S. Patton once said, "If everyone is thinking alike, then somebody isn't thinking." I could not agree with you more!!! I have not found a soap&glory bath/body product that I like!!! They all stink, I thought I was the only one in the world! Find solace in knowing that you are not alone in disliking the horrendous product! Their original scent is definitely a little strong, but I LOVE their "Fruitigo" scent - it's green, figgy, and a little minty, and by far the most (only?) unisex fragrance they offer. It's delicious and not cologney, as it may sound! I recommend you give it a sniff if it's available where you are! Soap & glory isn't available here, but I'll check it out the next time I'm somewhere that sells it.